Hypothetical discussion of options for external assistance for Ireland in today's Irish Examiner - here, text link - here, associated publicity - here. Last month I made a number of warnings concerning the price increases in some food sectors, specifically - milk and milk products. These warnings were based on my analysis of the figures for global commodities price trends and the newsflow from Russia and Central Europe. I also warned that Ireland is not insulated from these price changes due to the open nature of our trade. The latest data from CSO today shows that my predictions are turning out to be right. Milk, potatoes, sheep, vegetables, cattle and pig prices increased by 38.0%, 32.4%, 17.8%, 3.0%, 2.9% and 2.2% respectively, while cereal and poultry prices decreased by 28.9% and 2.8%. Energy prices increased by 15.5%, while seeds, feeding stuffs, fertilizers, plant protection products and veterinary expenses decreased by 9.3%, 8.1%, 5.2%, 0.9% and 0.1% respectively. 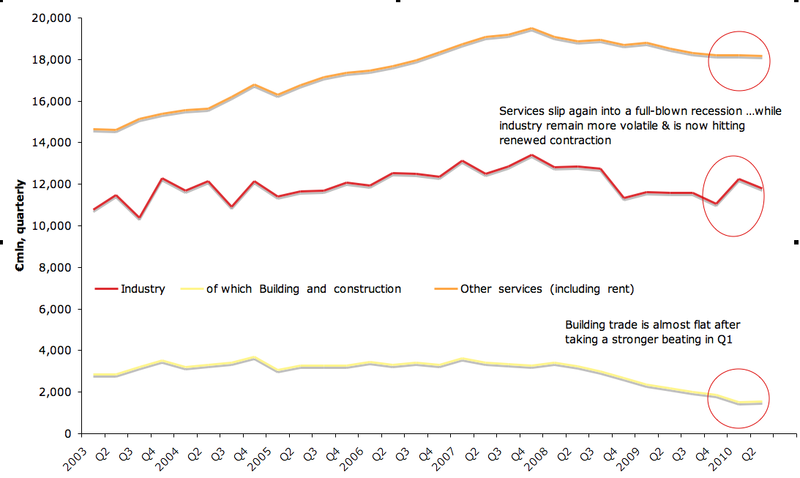 thereby undoing competitiveness gains in the private sector by overcharging in state-controlled sectors. 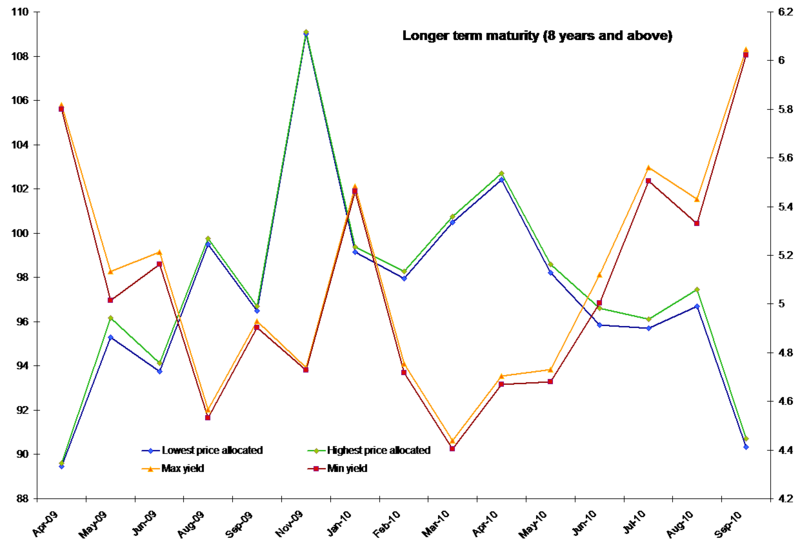 These numbers are not yet pricing the full extent of August events, so expect uptick in Q3 figures to be significant. 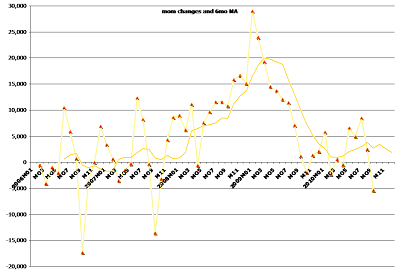 Live Register figures are out for September with the latest CSO numbers showing both an improvement and a deterioration in the labour market. Here are the details. 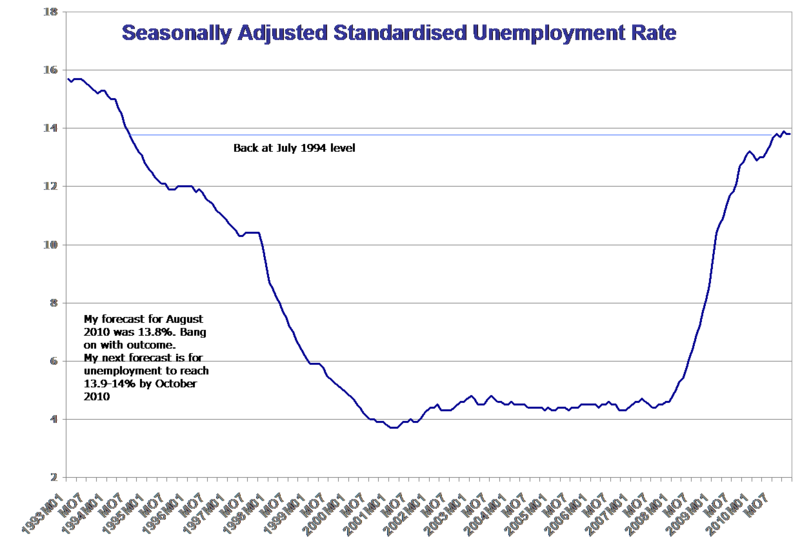 "On a seasonally adjusted basis there was a monthly decrease of 5,400 in the Live Register in September 2010. 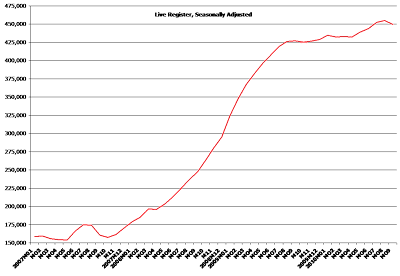 The number of persons on the Live Register now stands at 442,417 which represents an annual increase of 22,563 (+5.4%) in the unadjusted series. This compares with an increase of 30,198 (+6.9%) in the year to August 2010." 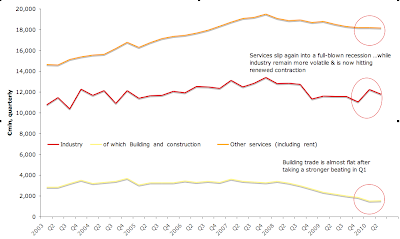 "In September there were 39,960 new registrants on the Live Register, which compares with 36,194 in the previous month [new registrants to LR rose significantly month on month in September, implying clearly that decline in overall LR was not driven by improvement in the labour market, but by exits from LR by workers who run out of benefits]. "On average 9,990 new registrants joined the Live Register each week in September, comprising 5,905 males (59.1%) and 4,085 (40.9%) females. By comparison, in March 2010 9,935 new registrants joined the Live Register each week, consisting of 6,340 males (63.8%) and 3,595 (36.2%) females." These trends - reflecting in my view exits from LR, rather than new jobs gains - is reinforced by the data that in September there was a monthly decrease of 2,412 (-3.1%) in the number of non-Nationals on LR, which suggest strong outflow of workers due to net emigration. 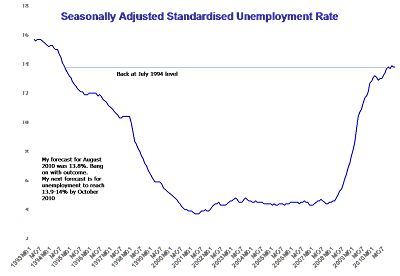 Implied unempoloyment rate now stands at 13.7%, down from 13.8% in August. 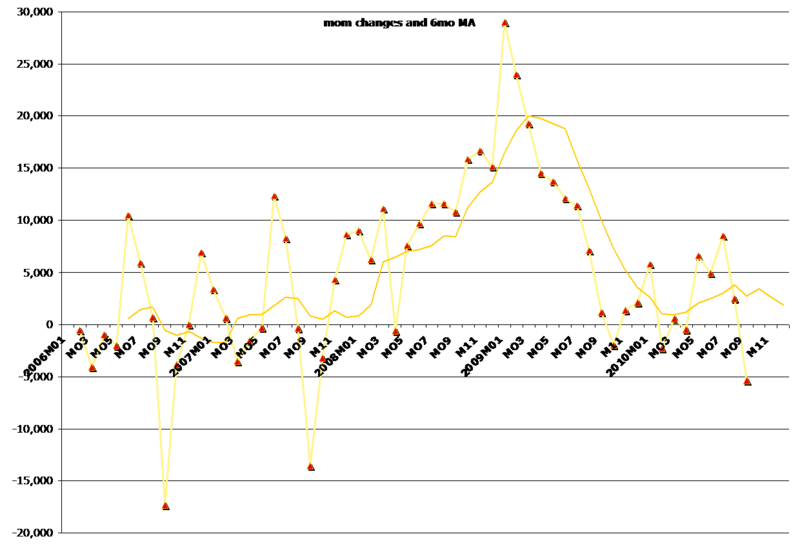 This means I will not be changing my forecast for Q3 unemployment to reach 13.9%. 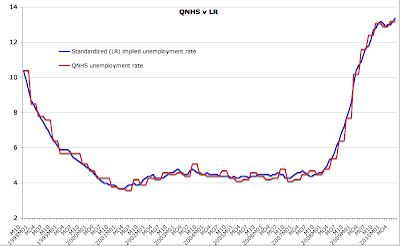 As promised last night - here are comparatives on Live Register and QNHS measures of unemployment. Actually 98.8% close. But recall, QNHS is quarterly, LR is monthly, so what about average quarterly numbers for LR and QNHS? "The Irish government will reveal the full horror of the cost of rescuing Anglo Irish on Sept. 30. It has already signaled bad news for the 2.5 billion euros of subordinated debt, but it is desperately trying to draw the line and support the 14.1 billion euros of senior debt. "It's cosseting the bondholders because it fears further damage to its own creditworthiness if it walks away. But if the Anglo bill is as big as outsiders fear, its support will have the opposite effect. Even as the Irish prime minister talked on Sept. 28 of a "manageable plan," the spread on Irish sovereign debt widened to a record 475 basis points. "The Sept. 30 statement is expected to contain a best estimate and a worst case. If the best estimate is near S&P's figure, further downgrades of Ireland's sovereign debt are likely. However, if the government were to abandon the senior bondholders, the saving -- equivalent to a tenth of Ireland's GDP -- would give the state the chance to work its way out of its economic hole." Here we have: S&P, RBS, Barclays, Reuters, WSJ, FT, Sunday Times (Irish edition - hat tip to F.F.) and all genuinely independent analysts are now saying - shave the seniors, burn the subordinates. Government still resisting. For how long can it afford demolishing our own economy to prolong the inevitable? Are business owners generally more or less financially conservative than their non-business-owning counterparts? Do business owners accumulate more wealth? Do business owners hold a smaller share of their financial assets in risky stock holdings? however, business owners and non-business owners invest similar shares of their financial portfolios in safe assets. So business owners are more risk averse in their own business ventures, but are about as risk averse in terms of their investment portfolios allocations as the rest of us. “Taken together, the results suggest that policies aimed at increasing business ownership should focus on helping households identify high-value business opportunities through transparent tax, legal, and regulatory systems. Efforts to reduce risk should focus on the business venture, such as full loss offsets, rather than focusing on reductions in other financial risks.” (emphasis is mine). A massive 12.26% of US households own businesses. Business owners are underrepresented in the lower income categories, making up about 3% and 5% of the lowest and second-lowest income quintiles, respectively. At the upper end of the income distribution, business owners account for 18% of households in the 80th-90th percentile range and 37% of households in the 90th-100th percentile range. Business owners comprise 2% of the lowest quarter of the wealth distribution and 43% of households in the 90th to 100th wealth percentile range. 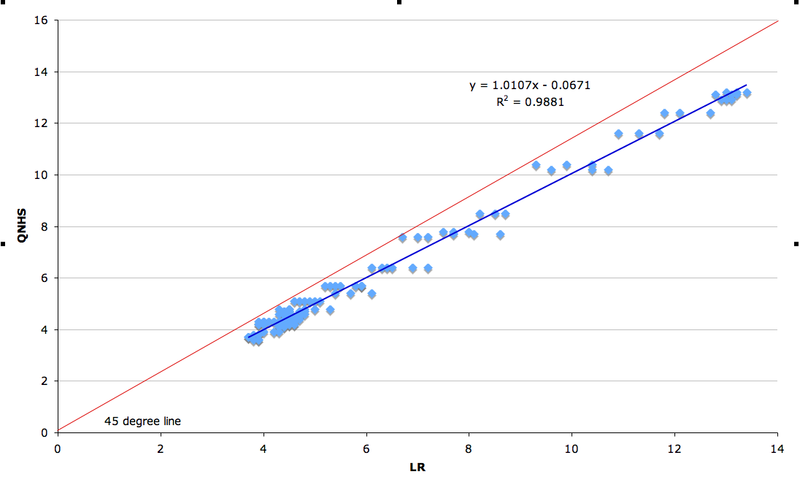 This, however, is a function to some extent of the fact that business owners earn higher incomes and accumulate more wealth, meaning they are unlikely to stay in lower incomes/wealth percentiles even if they start from there. So the last figure suggests that over time, the wealth gap with non-business owners is shrinking. Undoubtedly, a housing bubble helped here. So a natural question from my point of view was: "Absent net exports, how badly was our economy hit by the Great Recession?" 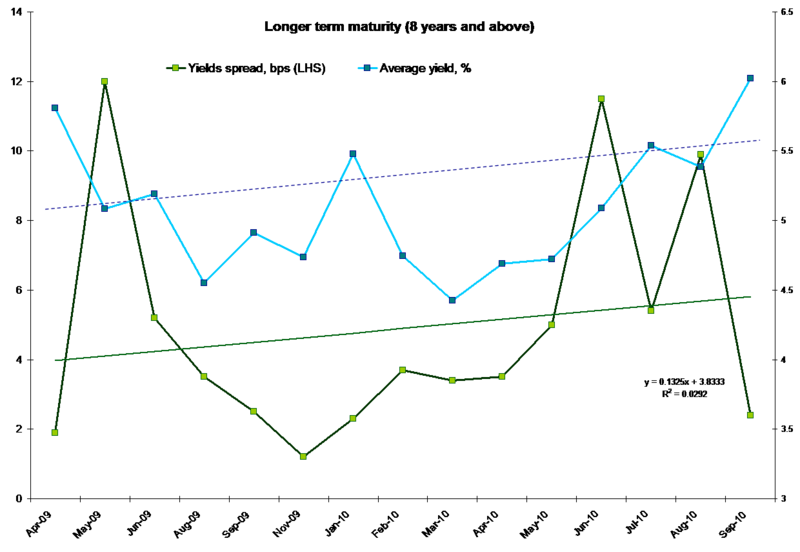 Here are the charts, taking our GDP and GNP (seasonally adjusted, expressed in current market prices) and subtracting net exports (exports less imports). To me, this paints a pretty clear picture. Given that the Government has provided virtually no supports for our exporters, the gap between each solid line and each dashed line shows the true extent of net exports contribution to growth in GDP and GNP. 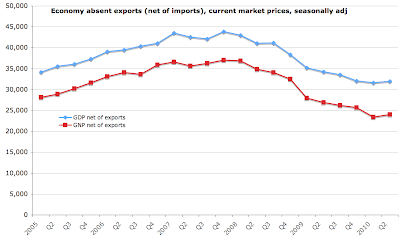 And this gap also shows that the economy more directly controlled by the Government has been tanking at a much steeper rate than the economy which includes our exporting firms. 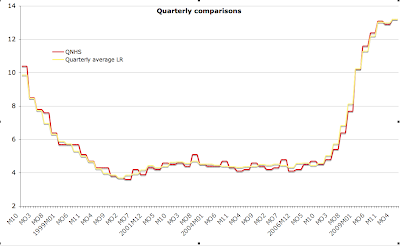 So in those parts of Irish economy where our Leaders had a say (red) we have suffered a decline in domestic income of cumulative 34.35% since 2007. In economy which includes the part which our Leaders have very little control over, the decline was 23.7%. One wonders if there is any truth whatsoever to the leadership claims on economic policy front we've been hearing in recent days?.. 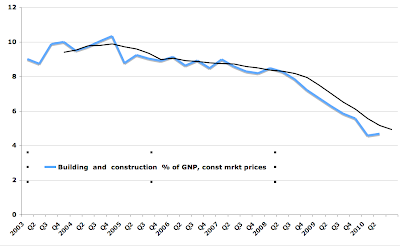 Eurocoin for August 2010 has confirmed that composite leading indicators for the Euro area growth are pointing to continued deterioration in growth in Q3 2010. Eurocoin has declined to 0.37 i n August from 0.4 in July, marking a 5th consecutive monthly drop. 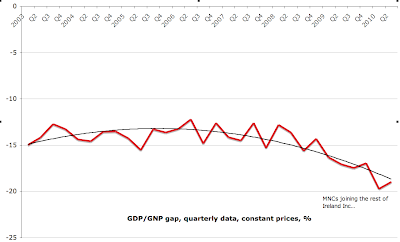 My forecast for next Eurocoin to reach 0.34 in September and Q3 2010 growth to slide to 0.2-0.25%. My previous forecast for Eurocoin for August-September (issued in June and confirmed in July) was 0.34. 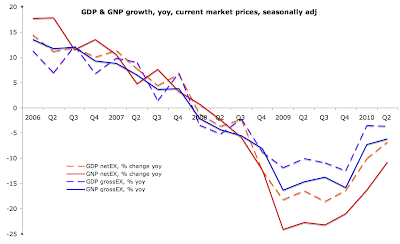 Economics 24/9/10: Still deep in denial? In the real of bizarre, we have two fresh statements from Irish officials. First, NTMA issued a statement claiming that Irish authorities - aka Irish taxpayers - will make up any shortfall on the banks capital side. One wonders if the NTMA has acquired new powers from the State - this time around, to determine our budgetary policy. 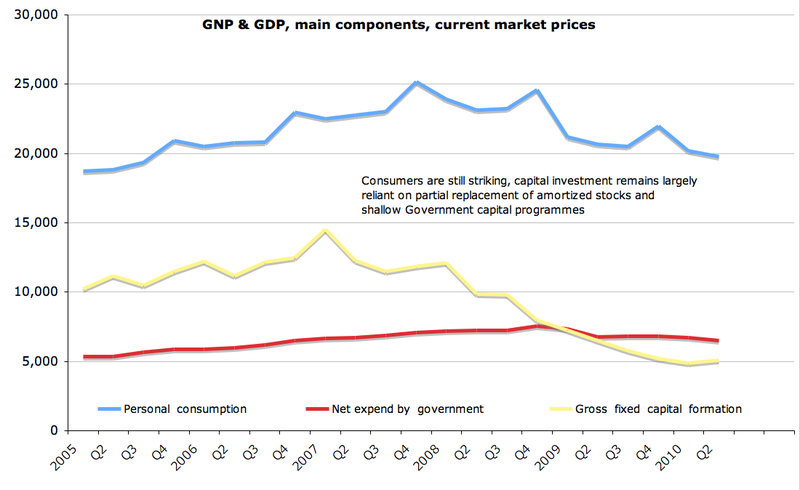 You see, per European authorities, capital support for the banks is a matter of national deficits. National deficits are a matter of fiscal policy. Fiscal policy is firmly a matter for the Exchequer (i.e the Government). NTMA is neither the Exchequer, nor the Government. What business does it have in making promisory statements to the markets concerning the matters of fiscal policy? our officials remain in a deep denial about both the extent of the problems and the required course of action. With a slight delay - here are the latest figures from the Quarterly National Accounts released yesterday. 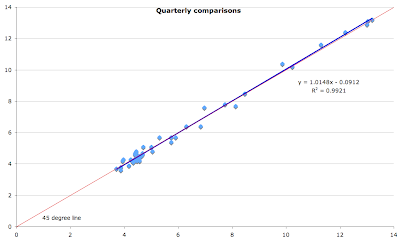 The headline number is GDP double dip - Q2 2010 posted a decline in real GDP of 1.2%, deeper than the decline in GNP (-0.3%), signaling weakening side of the external economy. 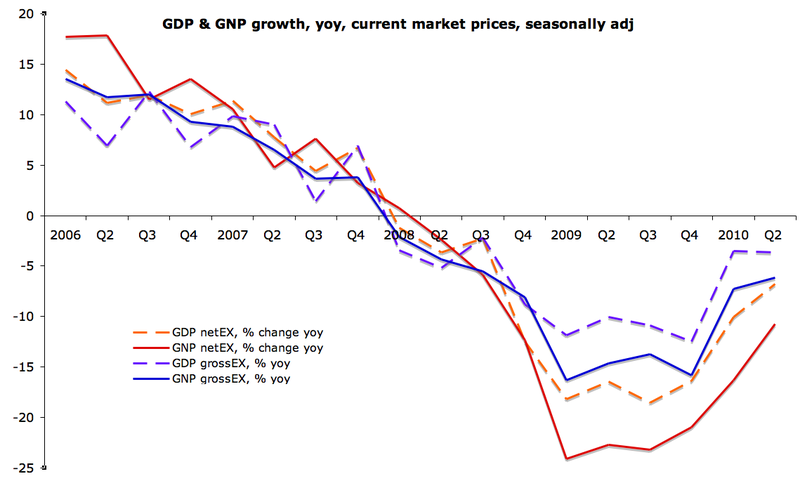 In constant market prices and seasonally adjusted, Q2 GDP stood at €41,130mln down 1.81% on Q2 2009 and -1.21% on Q12010. 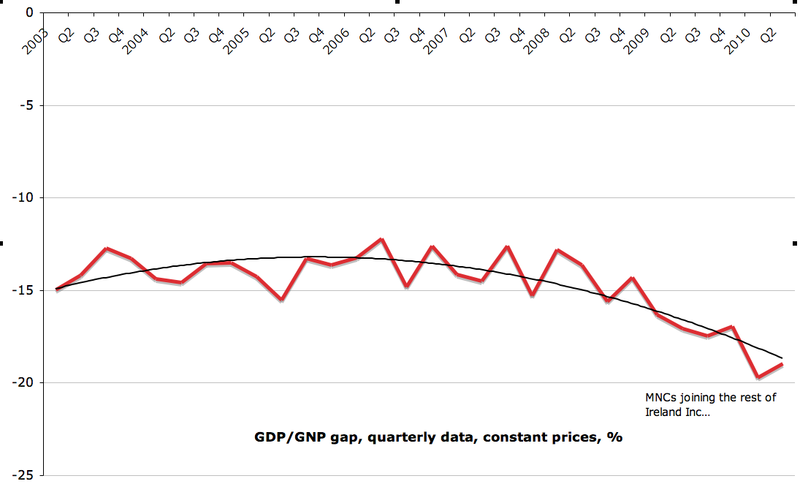 Cumulative H1 2010 GDP was 1.28% below H1 2009. 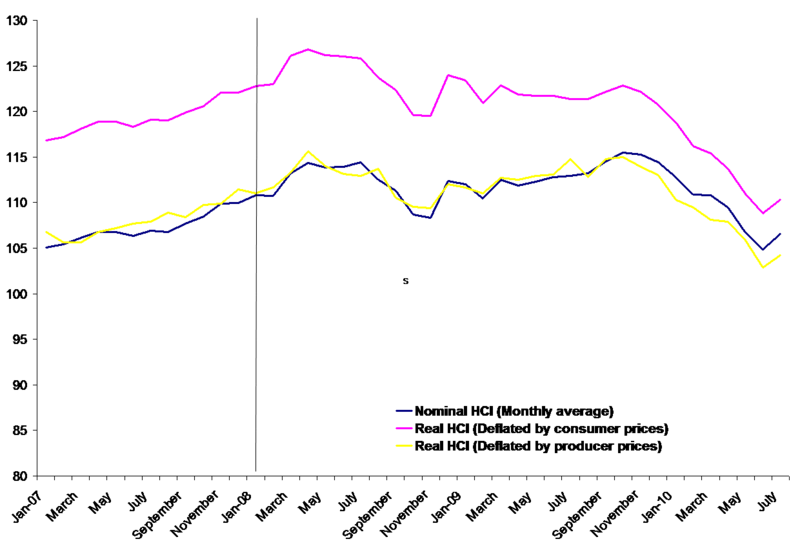 Despite shallower contraction in GNP, domestic income has suffered a much deeper contraction in the year to date. 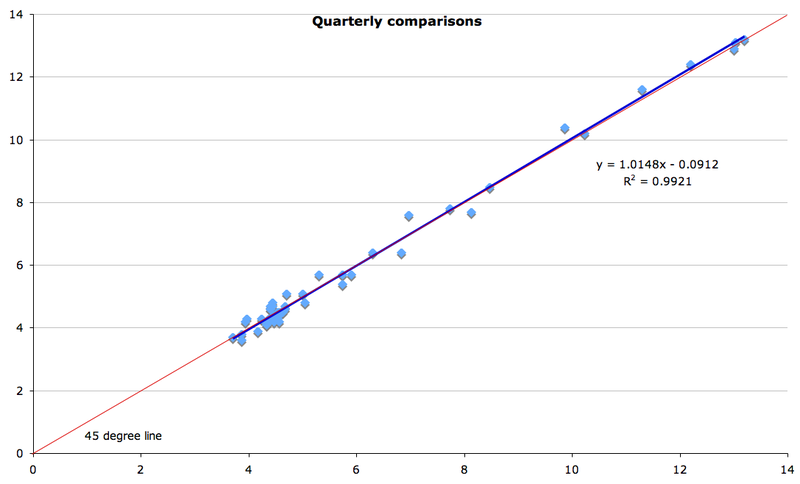 Quarter on quarter contraction in GNP between Q1 2010 and Q2 2010 was 0.278%, year on year GNP fell 4.05% in Q2 2010. 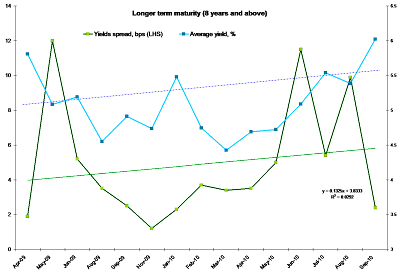 H1 2010 GNP was 4.42% below H1 2009. Let's put this into a perspective. 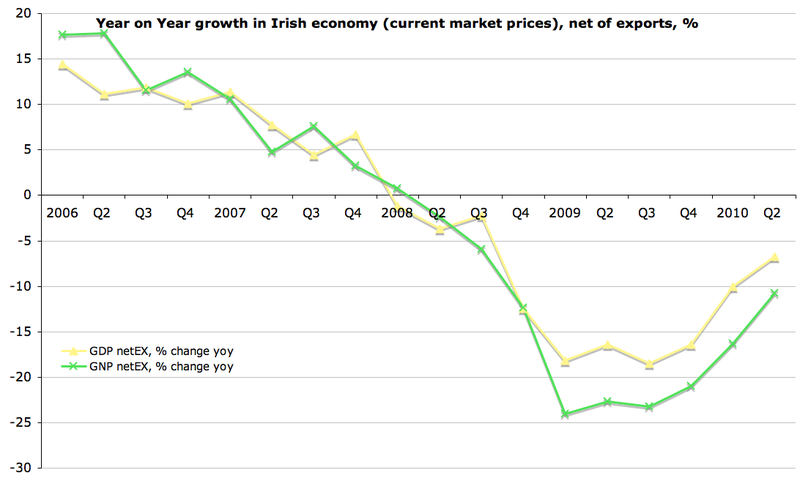 Over the course of H1 2010, Irish economy lost €3,087mln in income. Per latest QNHS, there were 1,859,100 people in employment in the country, which means that our economic loss in H1 2010 amounted to €1,660 per working person. 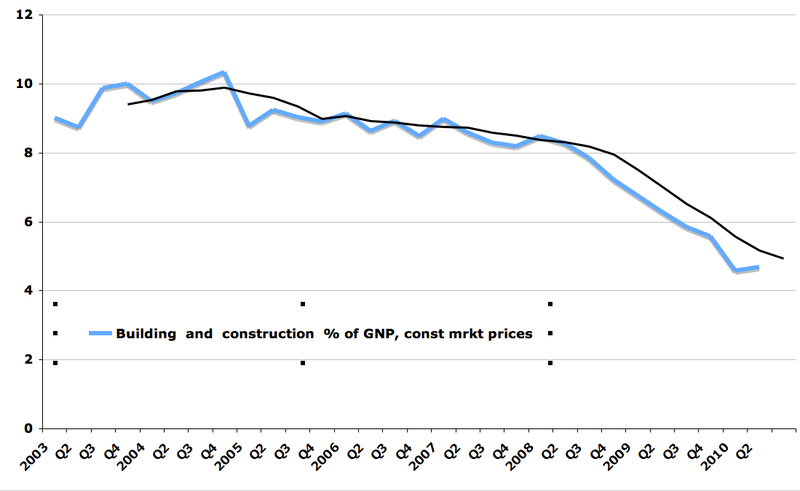 Since H1 2007, our economic losses total €13,078mln or €7,035 per working person. Annualized losses in national income now run at roughly €14,000 per working person since the Great Recession began. 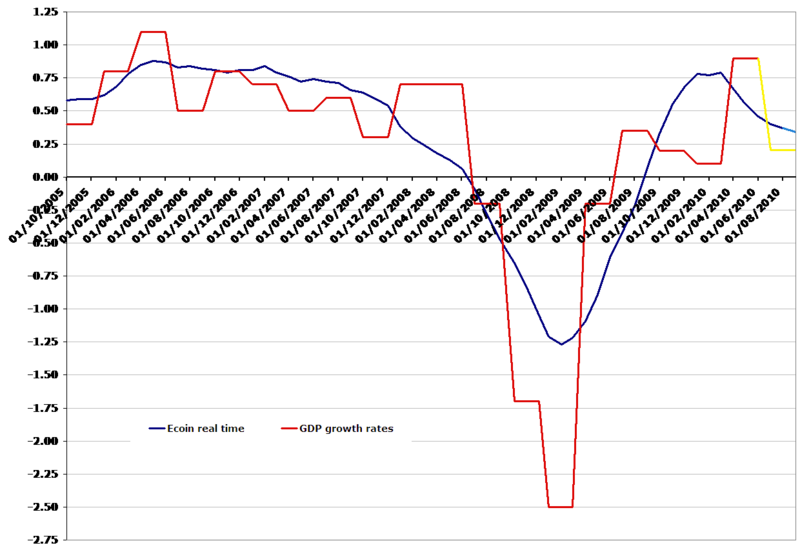 The slight recovery in GDP/GNP gap is, of course of little comfort. So here we go again: NTMA went to the market, ECB came along, the results are suspiciously identical (save for obviously increased costs of borrowing) to those achieved in August. We sold €500 million of 4 year debt due in 2014 at an average yield of 4.767%, compared with 3.627 percent at the previous auction on August 17. Cover on 4 year paper was We also sold €1 billion wort of 8 year paper due in 2018 a yield of 6.023%, up from 5.088% in a June sale. Cover support is clearly running well above average/trend, indicating potential engagement by the ECB. 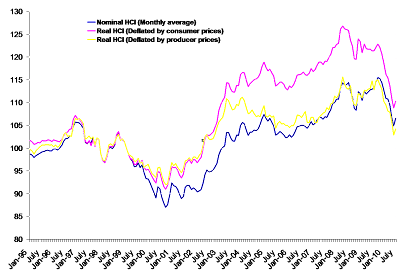 Price spread is down, suggesting that the yields achieved are reflective in the perceptions compression on behalf of bidders, which in turn might mean that the markets are getting more comfortable with higher risk pricing of Irish bonds. The dynamics are crystal clear - we are heading for a new territory in terms of elevated yields and lower prices. Actually, setting historical record in both, despite likely ECB interventions. Boom! The curve is getting curvier. Yield spread down as well - same reason - higher yields are now a 'normal' for the markets as average accepted yield shot up. Cover slightly up, perhaps being pushed by the bidders flowing from the shorter term paper - crowded out by Jean Claude Trichet's boys. Price spread is down (see yield spread discussion above). Returning to my old theme - let's take a fresh look at the Government and its policy cheerleaders success rate with repairing our banking sector. 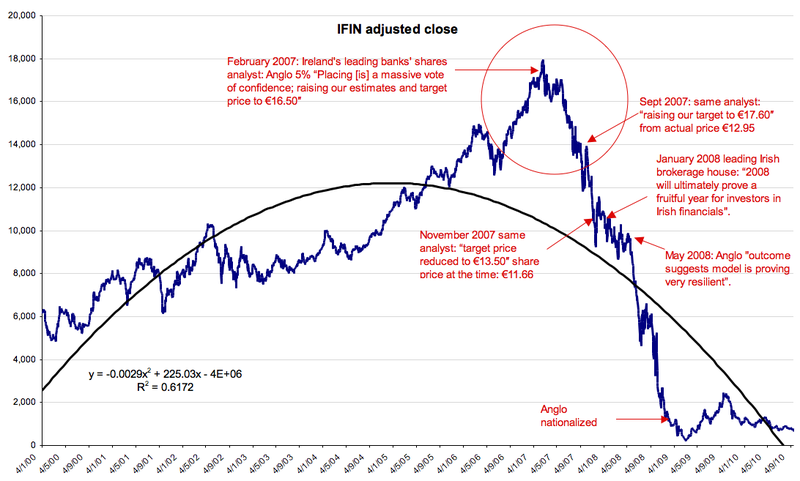 Here is a quick snapshot of history and numbers as told through the lens of Irish Financials index. So clearly, we have some really powerful analysts out there and keen commentariat (actually one and the same in this case) on the future prognosis for our banks. But what about recent moves in the index itself? Period 2: from Guarantee to today. Now notice the difference between two equations. That's right, things are not getting any better, they are getting worse. 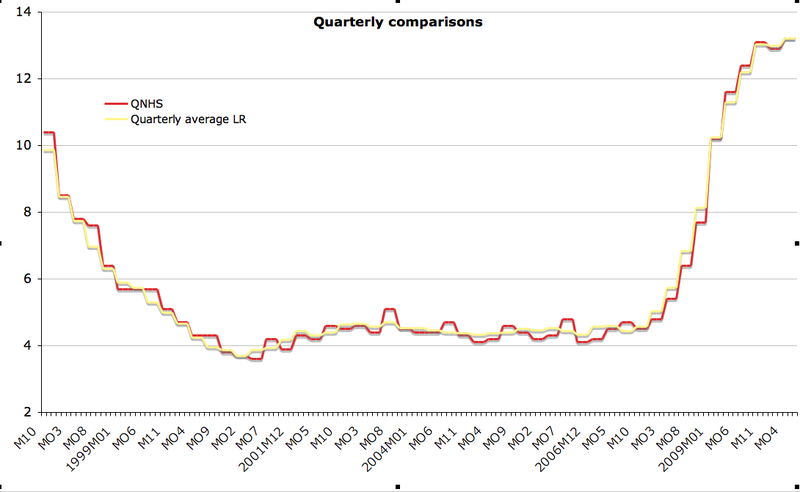 Surely, our financials are getting better, the Government will say, by... err... not getting much, much worse. 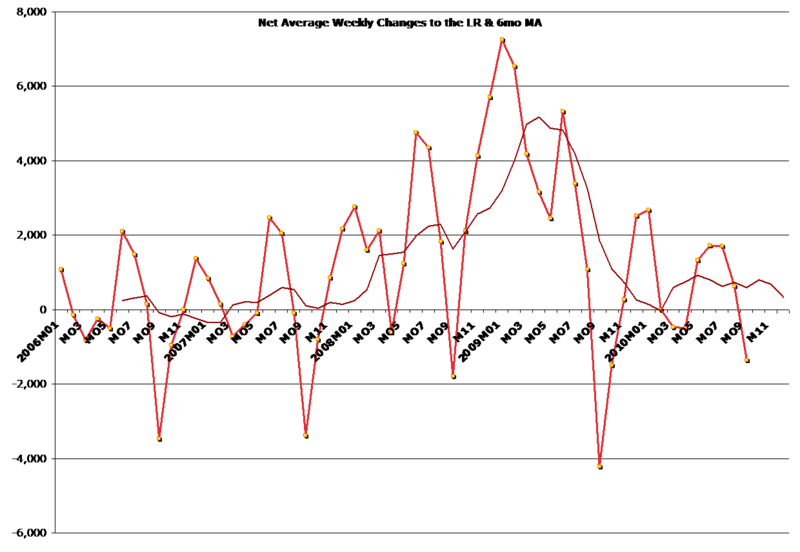 The reality, of course is, any index has a natural lower bound of zero. 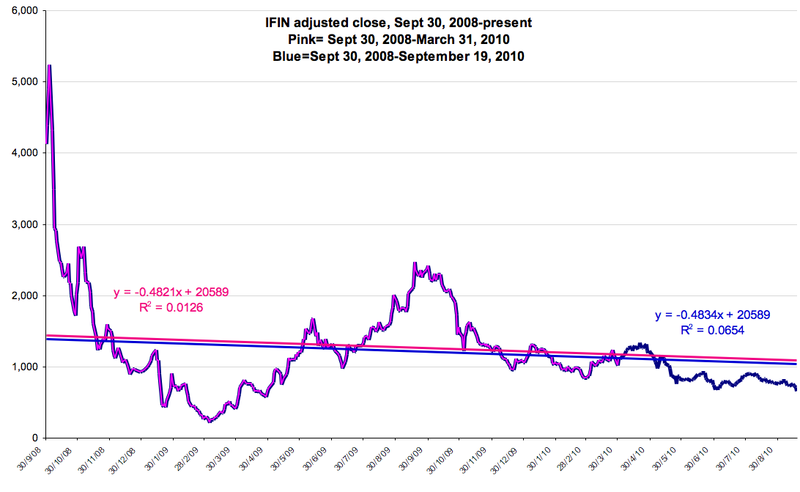 In the case of Irish Financials Index, this bound is above zero, as the index contains companies that are not banks. As far as the banks go, there is a natural lower limit for their share values of zero. 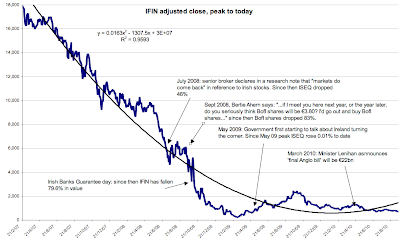 Our IFIN index is now at 80% loss relative not to its peak, but to its value on the day of Guarantee! Having pledged banks supports to the tune of 1/3 of our GDP already, the Government policy still has not achieved any appreciable improvement in the index. A picture, is worth a 1000 words. Unless you belong to the upbeat cheerleaders group of the very same analysts who missed the largest market collapse in history, that is. Economics 19/9/10: What's human capital got to do with our policies? Having spent last week giving three presentations in Ireland on our IBV paper (link here) concerning the role of human capital in urban and regional development, and having spent a week before given another five presentations/briefings on the same topic in Russia, I should probably take a break from the topic. So here is a quick note: I finally came about to read an interesting study from McKinsey & Co on the importance of talent as a driver of competition between firms, published back in February 2008. It is a very insightful piece. Here's an interesting quote, referring to two McKinsey Quarterly global surveys (emphasis is mine). "The first, in 2006, indicated that the respondents regarded finding talented people as likely to be the single most important managerial preoccupation for the rest of this decade. The second, conducted in November 2007, revealed that nearly half of the respondents expect intensifying competition for talent—and the increasingly global nature of that competition—to have a major effect on their companies over the next five years. No other global trend was considered nearly as significant." Furthermore, "Three external factors—demographic change, globalization, and the rise of the knowledge worker—are forcing organizations to take talent more seriously." Amazingly, there is little evidence to-date that policymakers have any idea the process of global competition for talent is underway in their economies. With exception of the US and Switzerland, every OECD economy puts the heaviest burden of taxation onto shoulders of the very same talent for which companies in these countries compete. Ireland is the case study here. After a decade and a half of aggressively incentivising foreign investment into the country (not a bad thing in my books), Irish leadership has left human capital - and especially internationally mobile human capital - bearing more than 3/4 of the total tax burden in the country. 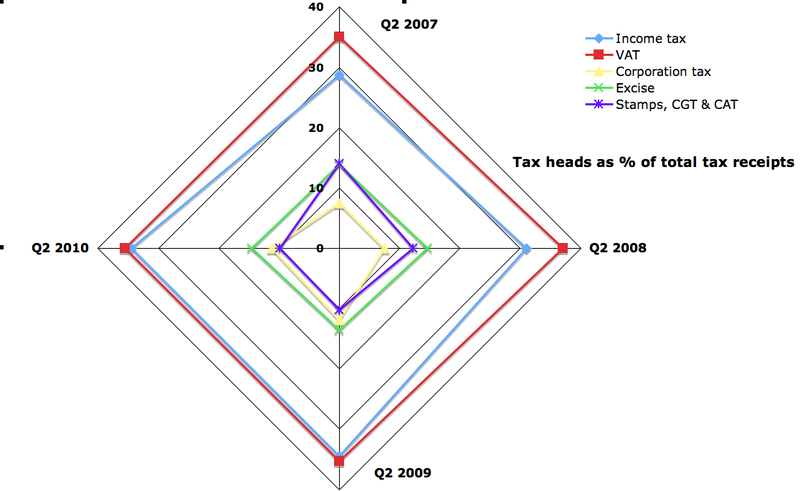 Now, this proportion is rapidly increasing (see chart), having risen from 75.31% in Q2 2007 to 80.42% in Q2 2010.
disturbingly high increases in income tax burden and other tax burden on disposable income by households. Anyone to spot a contradiction here? 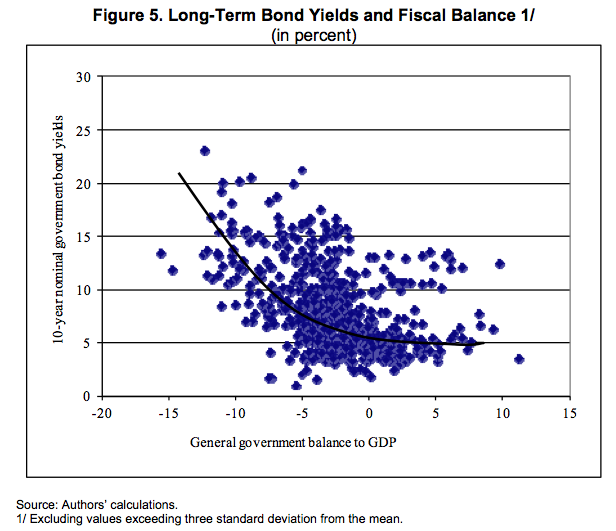 As argued in my earlier post (here), based on the IMF analysis, our sovereign bonds yields are still some distance away from those justified by fundamentals. It turns out the IMF paper cited in the earlier post is not alone in the gloomy assessment of our realities. 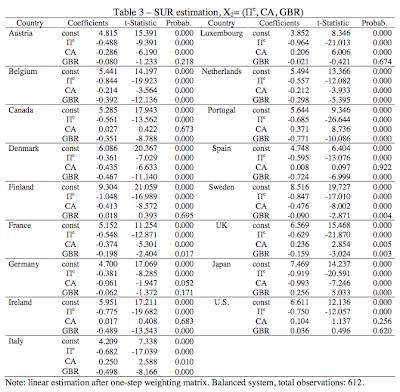 Another August 2010 study from German CESIfo (CESIfo Working Paper 3155), titled "Long-run Determinants of Sovereign Yields" and authored by António Afonso Christophe Rault throws some interesting light on the same topic, while using distinct econometric methodology and data from that deployed in IMF paper. Here are some insights from the paper (available for free at SSRN-id1660368). 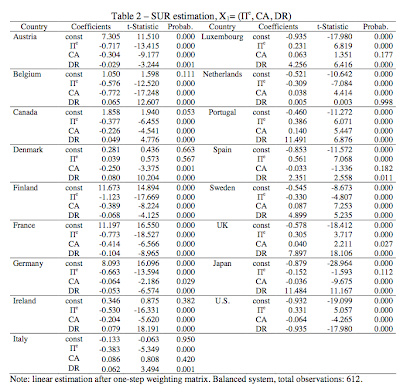 "For the period 1973-2008 [the study] consider the following countries: Austria, Belgium, Denmark, Finland, France, Germany, Ireland, Italy, Luxembourg, Netherlands, Portugal, Sweden, Spain, UK, Canada, Japan, and U.S."
Take a look at table 2 of results from the paper estimation across listed countries. 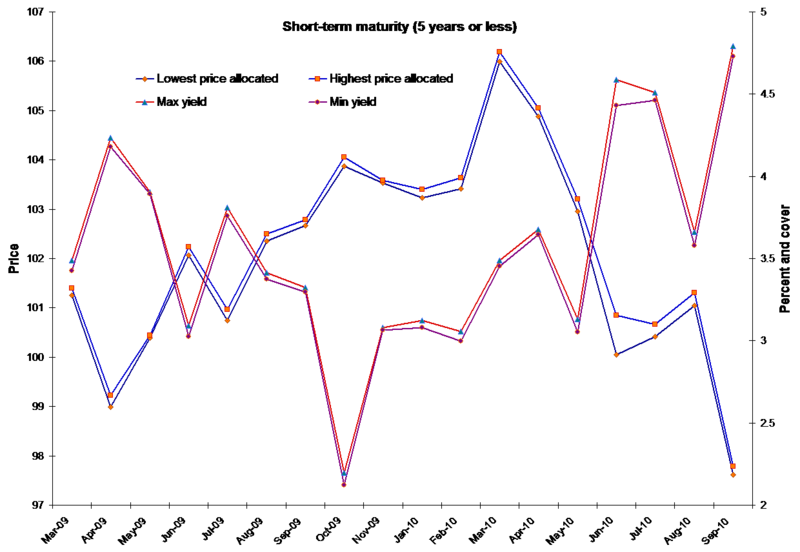 The model is based on 3 variables here - Inflation (P), Current Account (CA) and Debt Ratio (DR). All have predictable effect on the variable being explained. 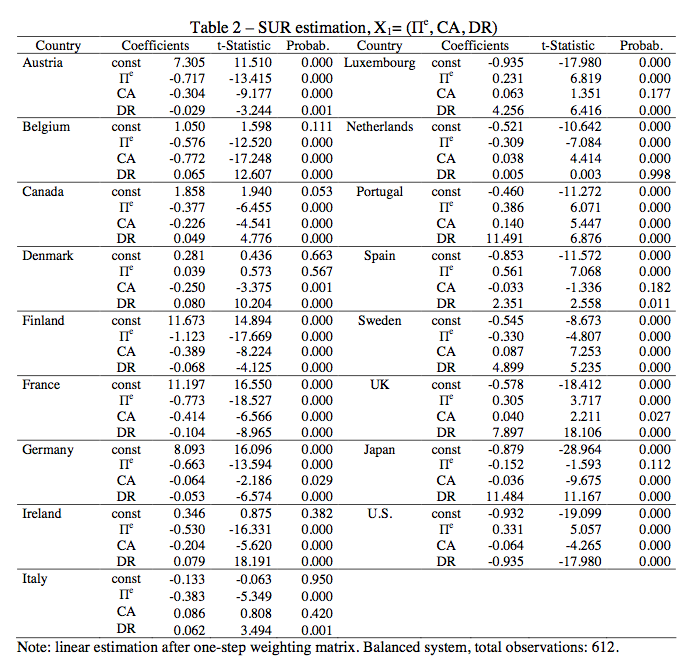 Per study authors: "Results in Table 2 show that real sovereign yields are statistically and positively affected by changes in the debt ratio in 12 countries. 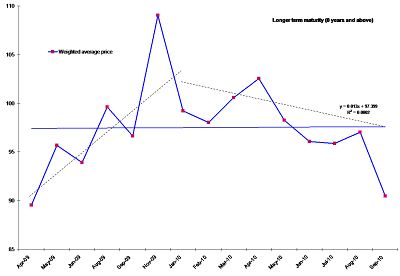 Inflation has a statistically significant negative effect on real long-term interest rates in ten cases. Since improvements in the external balance reduce real sovereign yields in ten countries, the deterioration of current account balances may signal a widening gap between savings and investment, pushing long-term interest rates upwards." 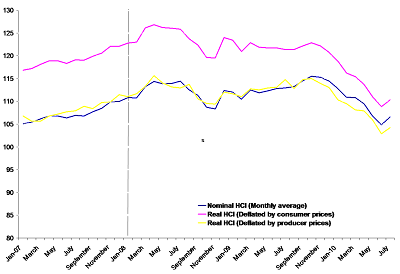 Ireland clearly shows relatively weak sensitivity in interest rates to debt. But take a look on our sensitivity to deficits. Per study: "Moreover, when the budget balance ratio is used (Table 3) a better fiscal balance reduces the real sovereign yields in almost all countries"
Clearly, Ireland shows 3rd highest sensitivity of interest rates to Government deficits. We are in the PIIGS group, folks, based on 1973-2008 data! 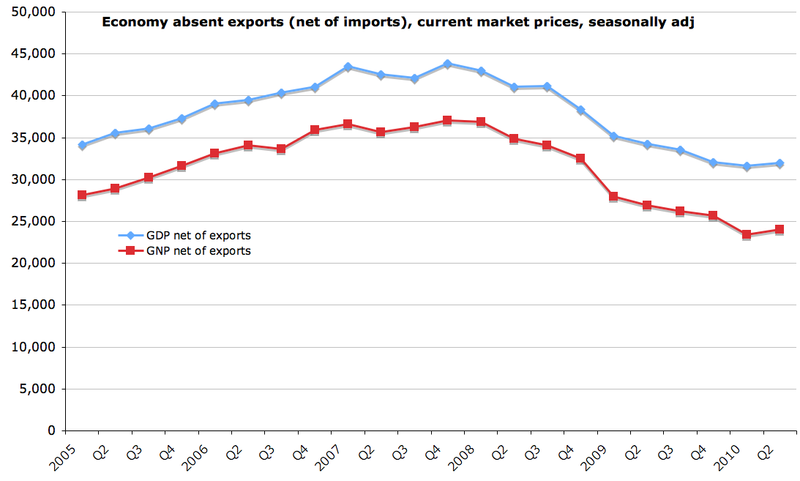 Now, this firmly falls alongside the IMF results - further confirming my guesstimate in the post earlier. 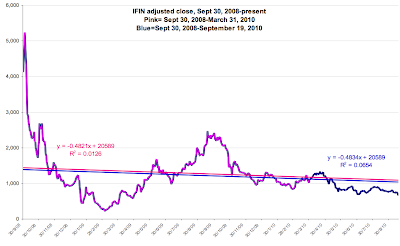 With all the debate, recently fueled by the Governor of our Central Bank and Minister for Finance, concerning the level of Irish bond yields, it is always insightful to look at the historic evidence as the source of better understanding of the underlying bond markets realities. Fortunately, courtesy of the IMF, there is some new evidence on this issue available. 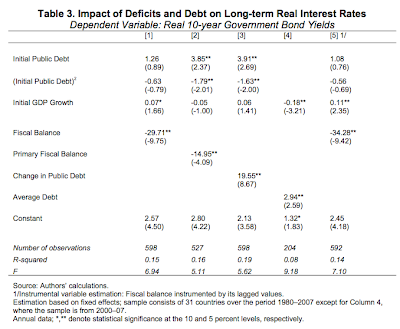 IMF working paper, WP/10/184, titled "Fiscal Deficits, Public Debt, and Sovereign Bond Yields" by Emanuele Baldacci and Manmohan S. Kumar (August 2010) does superb analysis "of the impact of fiscal deficits and public debt on long-term interest rates during 1980–2008, taking into account a wide range of country-specific factors, for a panel of 31 advanced and emerging market economies." In a summary, the paper "finds that higher deficits and public debt lead to a significant increase in long-term interest rates, with the precise magnitude dependent on initial fiscal, institutional and other structural conditions, as well as spillovers from global financial markets. 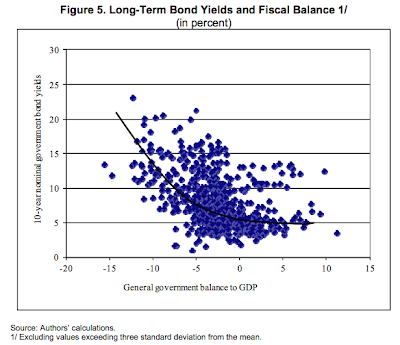 Taking into account these factors suggests that large fiscal deficits and public debts are likely to put substantial upward pressures on sovereign bond yields in many advanced economies over the medium term." By the above numbers, Irish bonds currently should be yielding over 7.54%. Not 6.5% we've seen so far, but 7.54%. 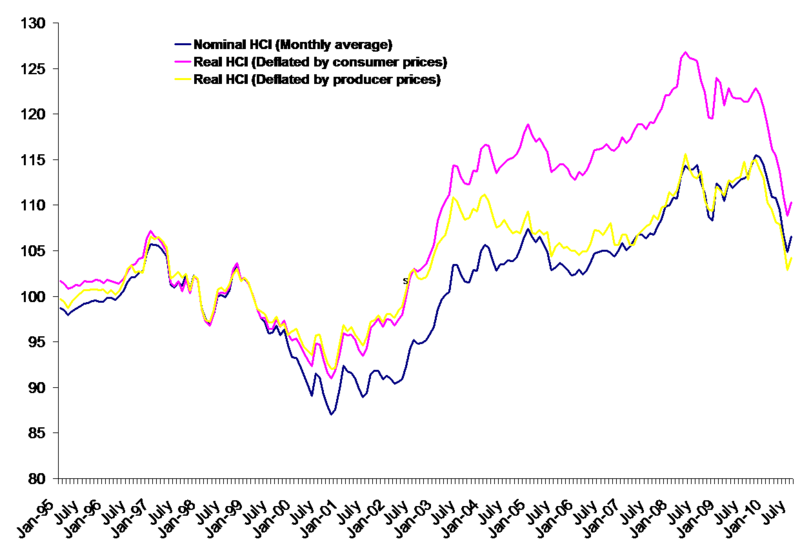 This puts into perspective the statements about 'ridiculously high' yields being observed today. 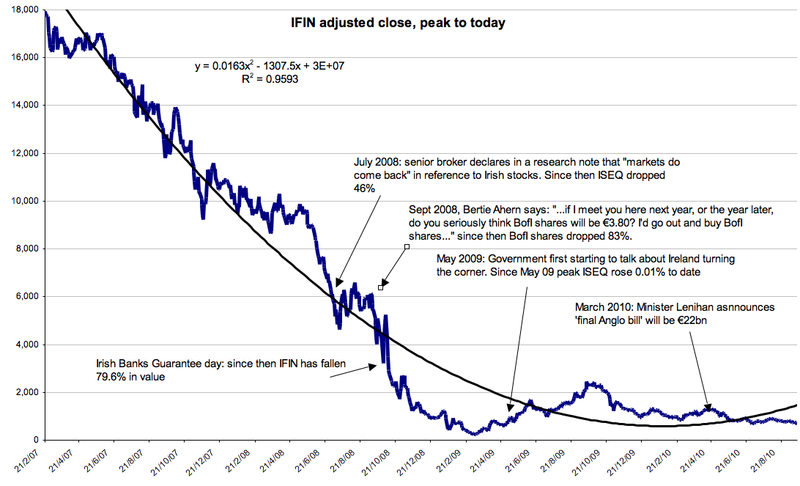 So the total, fundamentals-justified Irish 10 year bond yield should be around 9.30%. Don't believe me? Well here's a historic plot that reflects not a wishful thinking of our policymakers, but the reality of what has transpired in the markets over almost 30 years. Ooops... looks like our ex-banks deficits warrant the yields well above 10% and on average closer to 15%, nominal (remember the above yields computed based on model results are real). Alternatively, for our bond yields to be justified at 6.5% we need to cut our deficit back to around 5.2% mark and hold our debt to GDP ratio steady. 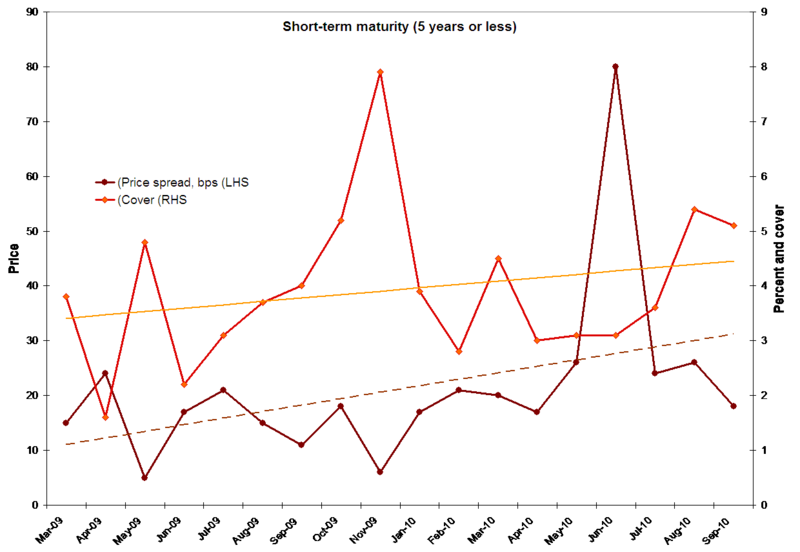 Someone, quick, show this stuff to our bonds 'gurus' in the Government. Another fascinating paper that I came across last night trolling through old files. 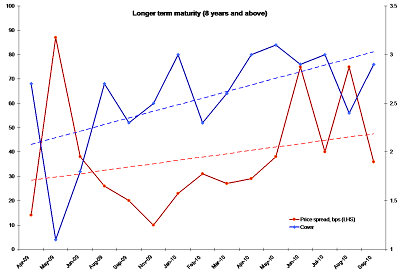 Published by FEEM as a working Paper 89, 2010, titled “Executive Compensation: Facts” it was authored by Gian Luca Clementi and Thomas S. Cooley of NYU and NBER. The link to the paper is here. 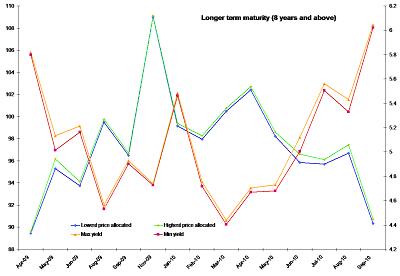 In this paper the authors look at the executive compensation in the US from 1993 to 2006.
the study findings are enlightening. The study does some basic stats. 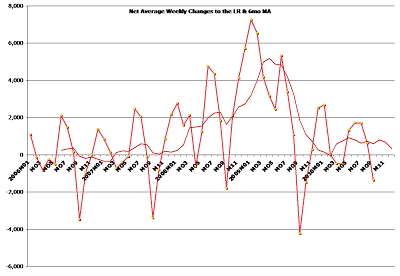 For example, in contrast to the Trade Unions’ claims that the average US executive compensation for larger corporations was $10.8mln in 2006, the study shows that due to a significant skew in the data, the average metric is meaningless. The median compensation for the largest corporate executives in the US therefore, was much smaller (although still substantial) at $4.85mln. 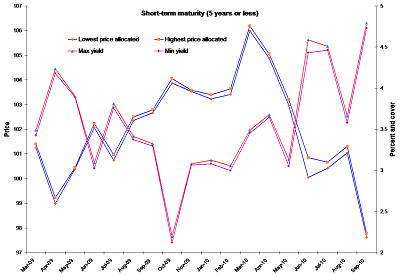 The study also reflects on the well understood, but rarely cited fact that due to significant share of compensation of CEOs being in the form of stock and stock options, in many years, many CEOs actually experience losses in terms of their overall compensation, not gains. The study is certainly worth reading as it contains factual analysis unencumbered by ideological bull usually found in the media. World Bank Policy Research Working Paper 5405, titled “Economic Freedom, Human Rights, and the Returns to Human Capital: An Evaluation of the Schultz Hypothesis” by Elizabeth M. King, Claudio E. Montenegro and Peter F. Orazem published in August 2010 is a very insightful read into the role of proper market institutions and rights in economic development. Paper link here. T.W. Schultz postulated, back in 1975, an important hypothesis for why returns to schooling might vary across different markets. According to Schultz, human capital is most valuable when individual workers face unexpected price, productivity or technology shocks that require managerial decisions to reallocate time and resources. In other words, in Schultz’s view, human capital acts as a hedge against such uncertainty. If skilled individuals are not exposed to shocks that require resource allocation decisions or if they are denied the freedom to make those decisions, then they will not be able to capture the economic returns from their skills. It stands as a logic corollary that if a country imposes economic or political institutions that cushion the shocks or hinder individual economic choice, then we should observe lower returns to skill in countries that limit exposure and/or individual responses to uncertainty. Now, this has three basic implications for Ireland. 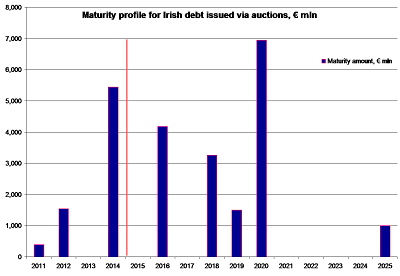 Firstly, the study results show that higher human capital returns (in other words greater incentives to invest in human capital) are associated with less restrictive labour market policies, greater extent of basic human rights protection, more pluralist system of social organization and lesser emphasis on equalization of outcomes in economic environment. In other words, market wins, crony capitalism (Irish model) and socialism (Swedish model) lose. Secondly, the study also implies that if Ireland were to be focused on developing a viable knowledge economy (aka human capital-intensive economy), the country needs more market, more freedom, less protectionism and lower restrictions in the labour market. Thirdly, the study suggests that environments with lower tax burden on labour and lower Government/State interference in private activities are more likely to produce better human capital base. Instead of farcical Mr Top Hat Kapitalist, it looks like free markets and societies benefit Ms Advance Degree Holder. A very interesting paper that a year ago should have alerted this Government to the fallacy of its preferred path to interventions in the banking crisis. Alas, it did not. Michael King Time to buy or just buying time? The market reaction to bank rescue packages, BIS Working Paper Number 288, September 2009 (linked here). H1: The announcement of government rescue packages will be associated with a narrowing of bank CDS spreads relative to the market. H2: Capital injections will be associated with a rise in bank stock prices relative to the market if the benefits of lower leverage and a lower probability of financial distress outweigh the potential dilution of existing shareholders or restrictions on payment of common dividends. H3: Asset purchases and asset insurance will be associated with a narrowing of bank CDS spreads and a rise in the stock price relative to the market. What the study found is that rescue packages confirm H2. But there was significant difference in the effectiveness of interventions. 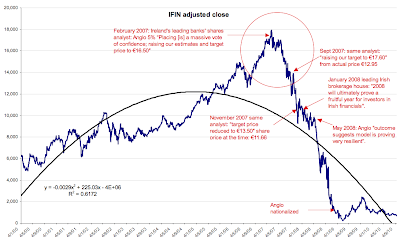 In contrast in Europe, “the risks of financial distress were also high as seen in the capital injections for Fortis and Dexia and the nationalisation of Bradford & Bingley. While banks were recapitalised, the cost and conditions of European rescue plans were punitive for existing common shareholders leading to an underperformance of bank stocks in most countries.” In other words, Europeans, predictably soaked equity holders but didn’t touch bondholders. Turning to the cases of asset purchases or asset insurance schemes, “market reaction provides only partial support for the third hypothesis (H3) that creditors took comfort from the reduction in potential losses and the decline in risk-weighted assets”. Oops, I’d say for the Leni/Nama plans. And this was known as of September 2009, despite which our Government has charged ahead with Nama. So in the end in the duration of 2008, no country has undertaken a significant Nama-like operation with exception of Switzerland in relation to UBS alone. Clearly the claim that Minister Lenihan was acting consistently with other countries in setting up a Nama vehicle is not true. The rest of the world was doing the same. 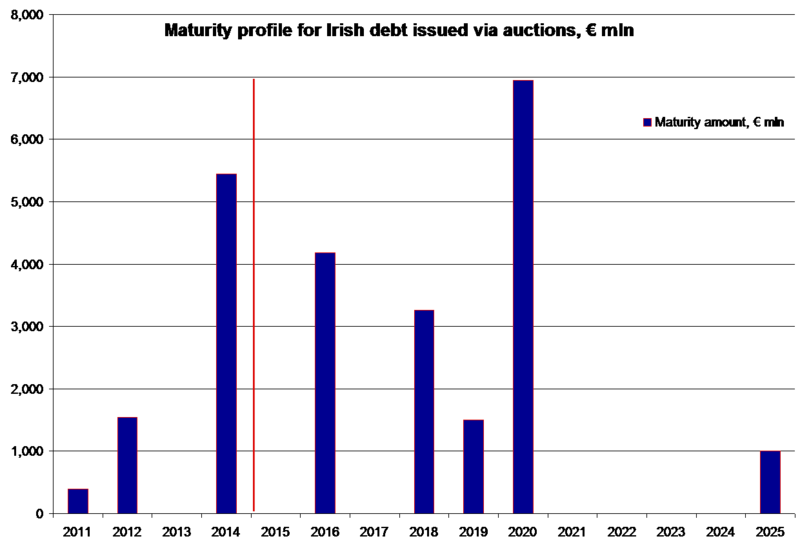 International evidence on the matter suggests that banks supports are only as good as the measures to reform banks taken after the supports enactment. 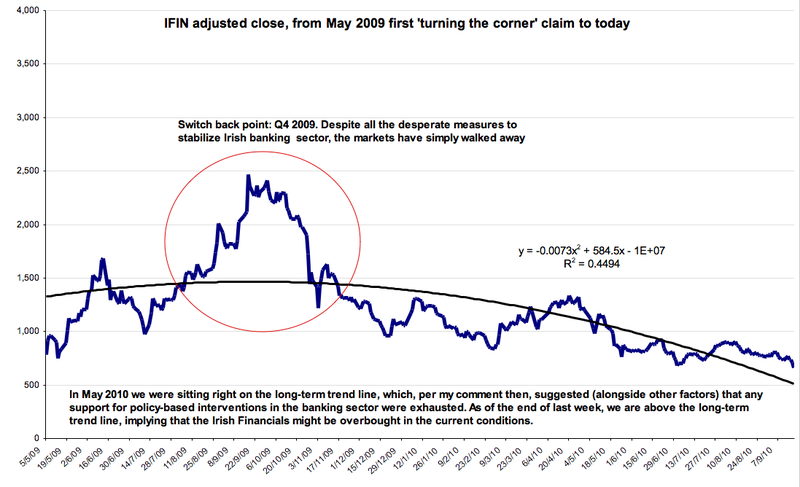 Of course, in the case of Irish banks, no such reforms took place since September 2008. All I need to add here is that this paper was available to Minister Lenihan's advisers, to Nama and to DofF and Central Bank handlers. The latter, alongside their Financial Regulator counterparts are linked to BIS. This is an edited version of my article in today's edition of the Irish Examiner. Two weeks into September and the crisis in our sovereign bond markets continues unabated. Ireland Government bonds are trading at above 6% mark and given the perilous state of the Irish banks, plus the path of the future public deficits, as projected by the IMF, Ireland Inc is now facing a distinct possibility of our interest bill on public debt alone reaching in excess of 6% of GDP by 2015. [Note: by now, the magic number is 6.12% as of opening of the markets today]. Sounds like a small number? Here are a couple of perspectives. 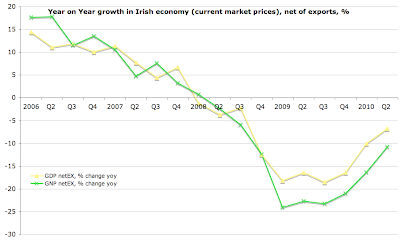 At the current cost of deficit financing, our Exchequer interest bill in 2009 was 1.7% of GDP or €2.8 billion. Within 5 years the interest bill can be expected to reach over €12 billion, based on the Government own projections for growth. By this estimate, some 30% of our expected 2015 tax receipts will go to pay just the financing costs of the current policies. It is precisely this arithmetic that prompted the Financial Times this Monday to question not only the solvency of the Irish banking sector, but the solvency of the Irish economy. The very same inescapable logic of numbers prompted me to conjecture in the early days of 2009 that our fiscal and banks consolidation policies will lead to the need for an external rescue package for Ireland. This external rescue package is now available, fully funded and cheaper (financially-speaking) to access than the direct bond markets. It is called the European Financial Stability Fund (EFSF). More than money alone, it offers this country a chance to finally embark on real reforms needed to restore our economy to some sort of a functional order. The EFSF was set up to provide medium term financing at a discounted rate of ca 5% per annum for countries that find themselves in a difficulty of borrowing from the international markets. With effective yields on our bonds at 6.05% and rising – we qualify. The EFSF requires that member states availing of European cash address the structural (in other terms – long term) deficit problems that got them into trouble in the first place. In Ireland’s case this is both salient and welcomed. 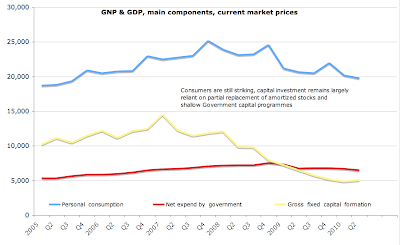 It is salient because, despite what we are being told by our policymakers, our problems are structural. Banks demands for capital from the Exchequer – a big boost to Irish deficit last year and this – are neither temporary, nor dominant causes of our deficits. In the medium term, we face continued demands for cash from the banks. By my estimates, total losses by the Irish banks are likely to add up to €52-55 billion (ex-Nama) over the next three-four years. These can be broken down to €36-39 billion that will be needed in the end for the zombie Anglo, €6bn for equally dead INBS, at least €8 billion for AIB and up to €2 billion for the ‘healthiest’ of all – Bank of Ireland. These demands will come in over the next 24 months and face an upside risk should ECB begin aggressively ramp up interest rates in 2011-2012. 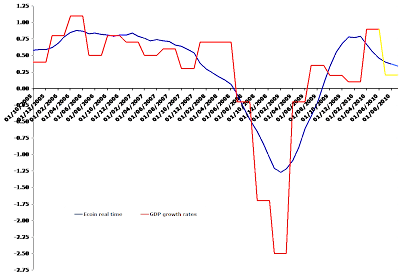 No economy can withstand a contraction in its GDP on this scale. Least of all, the one still running 5-7% of GDP structural deficits over the next 4 years. 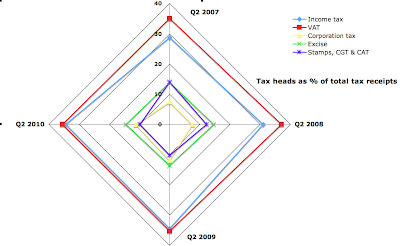 In 2009, banks demands for Exchequer funds managed to lift our deficit from 11.9% to 14.6%. This year, absent banks bailouts, our deficit will still reach around 11.3%. Only 3.3% of that due to the recessionary or temporary effects. In 2011, IMF estimates our structural deficit alone to be 7% and 5.9% in 2014. Which brings us to the point that the use of the EFSF funds should also be a welcomed opportunity for Ireland. A drawdown on EFSF funding will automatically trigger a rigorous review of our fiscal plans through 2015 by the European and, more importantly, IMF analysts. This is long overdue, as our own authorities have time and again proven that they are unable to face the reality of our runaway train of fiscal spending. Since 2008 in virtually every pre-Budget debate, Minister Lenihan has been promising not to levy new taxes that will threaten jobs and incomes of the ordinary people of Ireland. In every one of his budgets he did exactly the opposite. Under the EFSF, the IMF will do what this Government is unwilling to do – force us to reform our tax system to broaden the tax base, increase the share of taxes contributions by the corporate sector and start shifting the proportional burden of taxation away from ordinary families. Minister Lenihan has repeatedly promised reforms of spending. In every budget these reforms fell short of what was needed, while the capital investment was made to bear full force of the cuts. Drawing cash from the EFSF will make Mr Lenihan scrap the sweetheart Croke Park deal and start reforming current spending. Politically unacceptable, but realistically unavoidable, deep cuts to social welfare, public sector employment and wages, quangoes, and wasteful subsidies will become a feasible reality. Starting with December 2009, the Irish Government faced numerous calls from within and outside this state (headed by the EU Commission and the IMF) to provide clarity on its plans to achieve the Stability and Growth Pact criteria of 3% deficit to GDP ratio by 2014-2015. The Government has failed to do this. Drawing funds from the EFSF will help us bring clarity as to the size and scope of fiscal adjustment we will have to take over the next 5 years. Lastly, the EFSF conditions will include a robust change in the way we are dealing with the banks. Gone will be the unworkable Government strategy of shoving bad loans under the rug via Nama and drip-recapitalizations. These, most likely, will be replaced by haircuts on bond holders and equity purchases by the State. Contrary to what the Government ‘analysts’ say, drawing down EFSF funds will not shut Ireland from the bond markets. Instead, swift and robust restoration of fiscal responsibility and more a more orderly exit of the exchequer from banks liabilities are likely to provide for a significant improvement in the overall markets perception of Ireland. After all, bond investors need assurances that we will not default on our debt obligations in the future. Only a strong prospect for growth and recovery can provide such an assurance. Ministerial press releases and Nama statements are no longer enough. Funny thing the market is, at least if you are an Irish banker. Ex post the sale of BZWBK, the AIB therefore anticipated markets to rush to their rescue. This clearly is not what's on the minds of the markets. S&P last night held its A-/A-2 credit rating on AIB and the negative outlook, implying a new downgrade might be in the works. Oh, how dare they? AIB needs not €7.4bn (the minimum regulatory requirement capital top up), but more like €10bn to plug the hole in bad loans. It has managed to under-report (thanks to an accounting rule) losses in H1. The bank is now being stripped of the very few assets it has that actually make sense, leaving it with the legacy of its own actions and choices that is purely toxic. 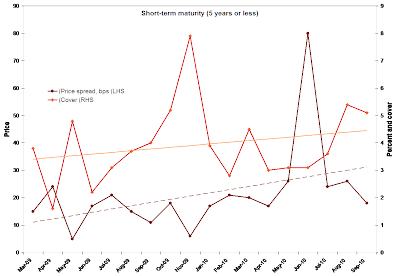 The markets don't buy the management 'plan' (what plan?) nor do they by the management team itself. The only thing that separates AIB from heading the Anglo route is the willingness of the Government to throw taxpayers guarantees and cash at the bank to rescue its shareholders and bondholders. How long will that last is an academic point at this moment in time. The real point is - AIB simply has so far shown no capacity to produce viable banking business short of buying into foreign-run assets. 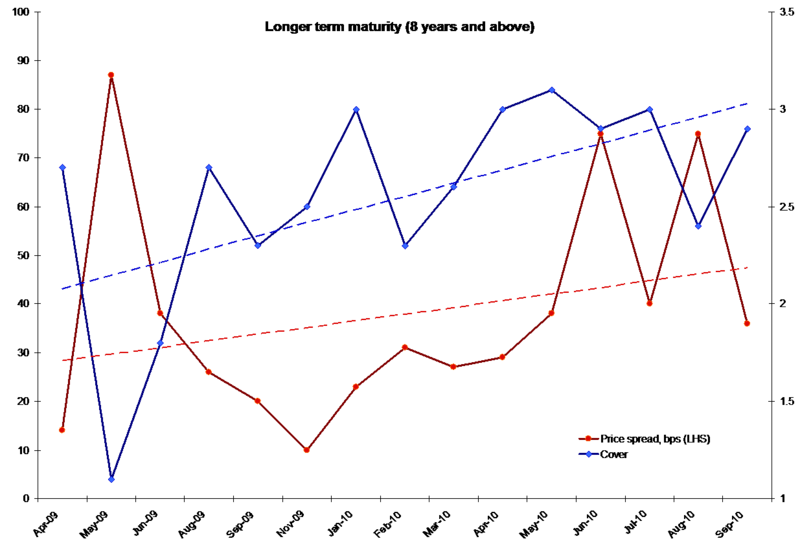 The first chart below shows historical trends in HCIs. 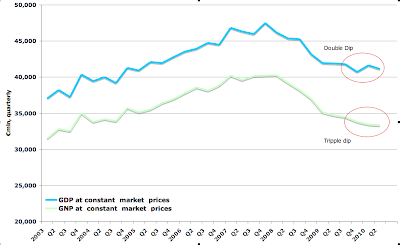 At the same time, the gap between our performance in HCIs deflated by producer prices and consumer prices clearly shows that these gains in competitiveness were not due to producer cost deflation (improved productivity), but due to massive deflation in consumer prices (margins erosion and collapse in domestic demand). 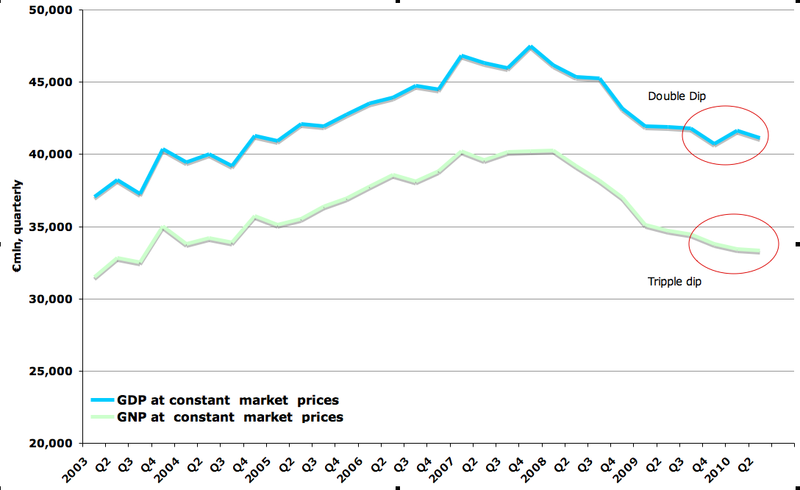 Loss of 1.4% (nominal) in competitiveness, contrasted by gains of just 2.4% in producer prices-termed HCI and 5.6% in consumer prices-termed HCI are hardly a matter of bragging rights for Ireland Inc.
Irish HCI data is strongly suggesting that so far in the recession, Ireland's producers have failed to gain significant inroads into productivity gains. Instead, lower retail prices so far remain the primary drivers of the improved indices reading. In my presentation yesterday at IBM's Extreme Blue event, I mentioned that we know very little about the location decisions of the modern migrants - people with high skills, education, aptitude, creativity and innovation capacity. An interesting new study from the Bank of Italy (“HOW DOES IMMIGRATION AFFECT NATIVE INTERNAL MOBILITY? NEW EVIDENCE FROM ITALY by Sauro Mocetti and Carmine Porello, Working Paper Number 748 - March 2010) assessed the relationship between “native internal mobility and immigration in Italy”. The study attempts to analyse “the impact of immigration on local labour markets and to gauge the consequences for the socio-demographic composition of the local population”. 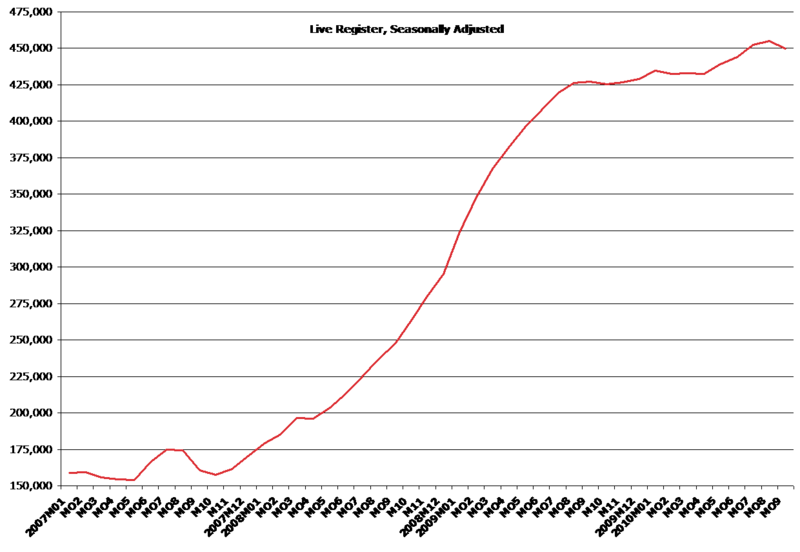 Traditionally, immigration into a given geographic region is seen as a driver of outward migration of the natives due to jobs displacement (the argument that by taking lower wages migrants force indigenous workers out of their jobs). 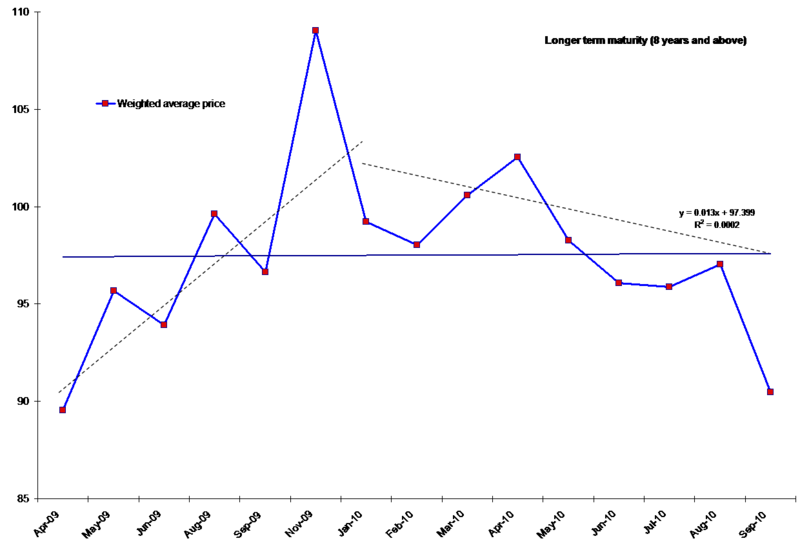 This is known as a substitution effect. Alternatively, there is a view out there that migration induces clustering of both migrants and domestic workers. the impact is concentrated among the young population and is somewhat stronger in more urbanized areas. Their study includes “house prices in the regressions to control for the effects through the real estate market; regarding “racial” preferences, they are likely to affect neighbourhood choice within a city rather than displacements across regions. Therefore, we argue that our estimates can be reasonably interpreted as the result of the interaction between immigrants and natives in the labour market.” The authors find that housing costs, associated with higher inward migration, do have a negative effect on the regions’ ability to retain domestic workers of similar skills levels. 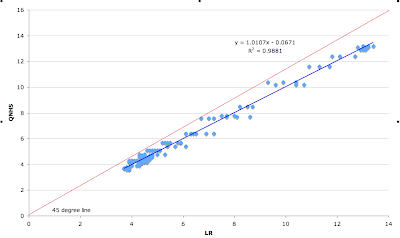 So on the net, while the study does not deal specifically with the high quality of human capital group involved in migration, the study does suggest that better skilled/educated workers tend to produce a clustering effect leading to complementarity with the native workers of similar skills and creating a pull factor for inward migration of highly skilled workers to a specific location. The offsetting deterioration in living conditions (due to higher house prices etc) is not sufficient in size to cancel out this positive effect. In today's FT (here), Wolfgang Munchau clearly states that (emphasis is mine): "...Irish banking sector is insolvent, and there are questions about the capacity of the Irish state to absorb those losses. ...two years have passed [since the crisis acknowledgement by the state] and nothing has been resolved. …As we saw last week, this strategy [of shoving bad loans under the rug via Nama and quasi-recapitalizations] came badly unstuck in Ireland. The Irish government massively underestimated the scale of the problem in its banking sector. On my own back-of-the-envelope calculations, the cost of a financial sector bail-out may exceed 30 per cent of Irish gross domestic product, if you make realistic assumptions about bad debt write-offs and apply a conservative trajectory for future economic growth. [Note: this blog has previously (here), on a number of occasions estimated the overall impact of the net losses realized by the banks to Irish taxpayers will be in the region of €62-75 billion, inclusive of Nama. Based on the Department of Finance own figures, this can be expected to amount to 38.5-46.6% of Ireland’s 2010 GDP or 48-58.1% of our GNP. Either range of numbers is significantly in excess of Munchau’s back-of-the-envelope estimate. However, even at 30% of annual GDP, the expected hit on this economy from the banking sector debacle is simply insurmountable. Munchau goes on to say that: “We know from economic history that countries enter into longish phases of stagnation after a financial crisis. [Needless to say, since April 2008 I am on the record – in the press, media, on this blog, in public meetings and private briefings to the policymakers – these are exactly the first steps that need to be taken in order to begin – note, just to begin – the process of restoring order to our banking system. Irony has it – on a number of occasions, I have written to the Financial Times precisely about these issues, raised by Mr Munchau, with, needless to say, not a peep back from the broadsheet offices].